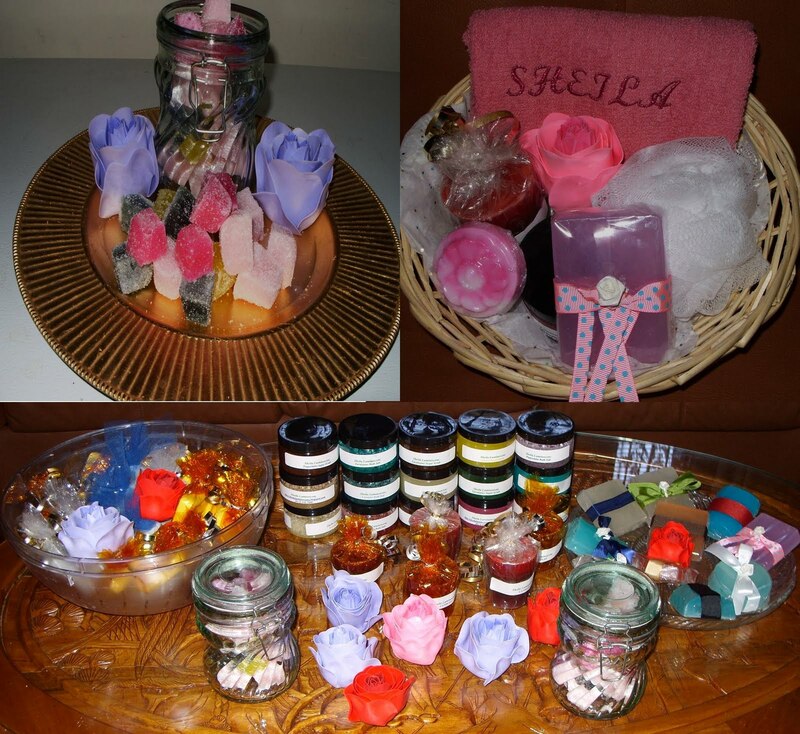 My sister hosted a Girls-Night-Out last nite and asked me to make body care sets for the gathering. Let me tell you, I am physically exhausted, but my mind will not let me sleep. 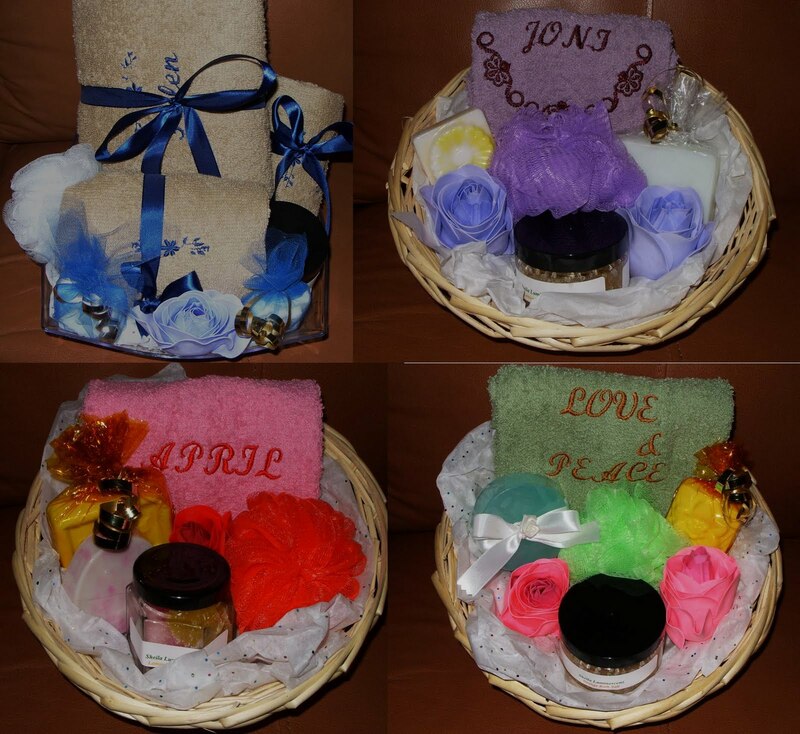 I spent all of Friday nite and Saturday preparing body care sets, sugar scrubs, bath salts, soap & candles. Pleasure products: all about enhancing one's love life, Jewelry: an array of pretty bling-bling, Body Magic: reshaping one's body, & lil ol' me Body Care: all about pampering & relaxing . My sister worked hard, set-up was great and the food was Delicious and if I wasn't spending so much time at the food table I would've had pics to show for all the hard work. However, I did take pics prior to the GNO. Honestly, it was a busy night and thinking back it was hard to take pics and demonstrate how to use the products. Also, a big shout-out to my Guy, who helped me tremendously with packaging everything, even running to the store at the last minute because I ran out of cellophane wrap. My poor guy had to run from store to store... how is it that all of a sudden, there was a shortage on cellophane wrap. I became nervous because it was taking him so long to return only to find out he had went to 4 different stores before finding cellophane wrap. Wow - that's alot of work - makes sewing seem very easy! What a lovely collection of baskets. You really are one talented lady! Wow! You have created such beautiful baskets. You are loaded with talent! I know the ladies loved their gifts. Very nice gifts ! If I lived in your neighborhood, I would have popped in !!! My goodness super woman!!!! Those look beautiful.. I can imagine the work involved! Lovely assortment of gift baskets. Well done. I needed to be at that party!!! Oh my! Everything looks wonderful. Very professional. It was definitely a lot of work and enjoyed it tremendously. @ Ann's Fashion Studio: The only items I didn't make were the bath rose petals and sponges, which I used as fillers. @ Cici: The pre-ordered sets had names embroidered on the towels and the other towels (which I failed to photograph) had aztec designs embroidered on them. Aww... looks like lots of fun! Pretty! You did a great job. That's a lot of beautiful works! Girls night out sounds interesting which we don't have here in Japan. The baskets are very impressive!! I have been sewing but I'm in withdrawal for a good knit dress. I need a new one and SOON. Very nice sets indeed! I'm impressed! p.s. All of your Slice products are 40% off right now at Michaels!